It’s a cut to the chase kind of day. 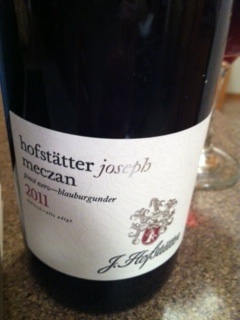 The wine is called hofstatter joshph meczan. It is a Pinot-Nero-blauburgunder. Alto-Adige, 2011. The common layman, or rather, any of the poor fools Jay Leno interviews on the street isn’t going to have the faintest as to what this is, let along what region it is. (Psst: Italy). It kind of sounds Norwegian, Italian and German all in one–WWII would have been proud to name this the wine of the war, most often picked by the Axis of Evil. Almost. Except at the core of this wine is goodness. Pure goodness. Pinot Nero, or Blauburgunder, is a Pinot Noir. This one opened on the nose a little spicier than the last one I had. More pepper, black fruit with cherries. It was a nice “chill” kind of wine with medium acid, medium-long finish with good balance (13.5% alcohol level). I am just drinking it to drink it–which is nice, but think it will go really well with some earthy mushroom, well-spiced pork, salty turkey–something that screams, “I CAME OUT OF A FORREST.” It also soothlingly proclaims, “I’m mellow.” Mixing metaphors, like sounds of its origins, seems okay to do. The wine shop I purchased this at proclaimed it was the owners favorite wine. But then again, I couldn’t find a Sauternes, Riesling, or the usual go-to wines, so you be the judge. (This might be another Jay Leno moment, I know). This bottle is very nice, and I would bring this over to a friends, or drink the bottle over two days, but I have new-employee orientation in the morning, so… You can bet your inner evil-superhero I’m making the 5 am workout in the morning.